Are you disappointed with Vampire Weekend’s new album Contra? Then maybe what I discovered on Twitter and saw on a London ice rink will help ease your pain. At the very least, it should get you to listen a little closer and wonder if their live show will complete the story. Ya know, part of me wants to tell my wife Colleen that I was right about Vampire Weekend being just a indie-rock buzz band that got way to much attention. But I can’t say that (yet). I’m still split 50/50 on whether or not I “like” the new album. I’ve been down this road before when listening to a new album or even writing a review. Many times I’ve quickly and prematurely dismissed an album base not just on the merits of the music. But because down deep in my heart and mind I’ve decided that — for some strange and subconscious reason — the music doesn’t match or satisfy my emotions at the time I first listened to it. And in those situations what usually happens is that months later I end up liking it because my emotional context and mood are in full sync with the album. And then there’s experiencing the music live during a concert. I’ve been to many shows that have put “the album in question” in to a more enlightened context of the live concert, allowing me to experience key emotional tipping points that the record alone doesn’t. But will seeing Vampire Weekend again on their Contra tour help tip the scales either way? Long story short, a lot has happened in my life over the last few months, so I’m aware that it might be easy for me to just quickly dismiss Contra’s laid back electronicized afro-pop. But part of me likes and is drawn to the laid back vibe, so I’m not sure if I love it or hate 100 %. So, like I said, until I see them live again, right now I’m split. But until then I wanted to share with you two short stories that have guided me along the path to making a decision and figuring this all out. First, I’ll show you how after listening to Contra I tweeted my honest thoughts and unexpectedly connected with and was challenged by a Vampire Weekend fan on Twitter. And then we’ll take a peek at what Vampire Weekend is doing with their live show and see what happens when they put their fans on ice. And that tweet brought back a surprisingly prompt reply. After I sent out my initial tweet I received a reply from Andrew Weaver (@drewmaniac). This was the first time I had recieved an @reply from Andrew so I was excited to tweet with him for the first time. And Andrew’s insight has since influenced my impressions of Contra. After reading his tweet, quickly I responded back and asked about his desire to see Vampire Weekend live. But it was unique because I made a connection with a fellow concert fan who also brought me to a better understanding of how far some fans have to travel to see “good” live music. After I read his tweet I thought more about how I close I live to, and even at times, take for granted Chicago’s vibrant, eclectic and close music scene. I’ve driven across the country to see a concert before. But usually the farthest I would have to drive to enjoy “good” or even great live music on a regular basis rarely exceeds 30 -45 minutes. I don’t know if Drew will end up driving that 2 plus hours to see Vampire Weekend, nonetheless his tweet made me take a moment to ask myself how far would I drive to see a band who’s album I really loved or was unsure about. Shortly after my twitter interaction with Andrew, I read this Stereogum post about Vampire Weekend performing on the Craig Ferguson’s Late, Late show and putting on a concert for fans on a London Ice rink. 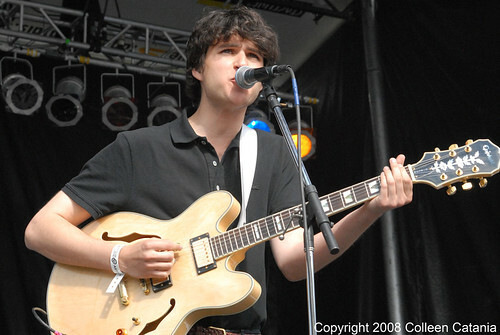 When I saw Vampire Weekend at Pitchfork in 2008 I wasn’t that impressed because they were stiff and their performance left me feeling kinda blah. And by the looks of this Late Late Show clip, it appears that they’re still dynamically challenged in a live setting. But what I enjoyed the most was this London Ice Rink video below. The band interview made me chuckle and wonder what Vampire Weekend is trying to do to their fans. I never like to laugh at the pain of others, but this video is pretty funny as the reporter asks Vampire Weekend what it’s like to play in such cold weather and how they feel about seeing fans skate around and fall down on the hard, cold ice during their concert. And by the way, I also enjoyed reading Andrew’s blog after our Vampire Weekend twittering. Go check out Leave It To Weaver. Would you like to see and experience Vampire Weekend on ice more often? Have you had similar connections or live show revelations with fellow fans on Twitter? I’m not so sure I can help you understand Contra. I just know I am really happy with this album. My expectations were low going in, because I have seen so many sophomore albums bomb.